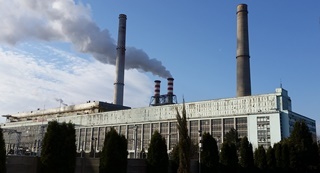 Within the framework of a modernization program, Societatea Complexul Energetic Oltenia S.A. (CE Oltenia) signed a contract with GE Power Romania for the turn-key supply of a dry bottom ash handling system to replace the existing wet system in its lignite-fired Isalnita Power Station, in Romania. GE Power choose in turn Magaldi’s dry technology to reduce the unburnt particle in bottom ash and increase the overall dependability of the bottom ash handling system. In order to recover the ash sensible heat of the unburnt fuel contained in the discharged bottom ash, the Magaldi Ash Post-combustor (MAP®) system was adopted to retrofit Unit 7, replacing the existing wet bottom ash handling system (Submerged Chain Conveyors – SCC). The MAP® system is able to extract, convey and cool bottom ash in a dry way and to enhance and control the post-combustion (PCB) of unburnt particles on the steel belt (Superbelt®). Magaldi’s proven dry bottom ash handling technologies help to marginally improve the boiler efficiency, allowing a reduction of the UBC (Un-Burnt-Carbon) content in the bottom ash, recovering chemical energy back to the furnace and eliminating any use of water as bottom ash cooling and conveying medium. At Isalnita Power Station, bottom ash falling from the transition chute will be collected and dry conveyed by the MAP® system, allowing to continue the combustion process. Thanks to the strong UBC (Un-Burnt-Content) reduction obtained by the post combustion (ranging from 15% up to 40%) of the bottom ash on the Superbelt®, the MAP® system will be able to recover and send back to the boiler all the chemical energy contained in the bottom ash, otherwise lost in the water bath of the SCC. In this way, the MAP® system leads to a substantial boiler efficiency increase which in turn will imply a reduction of GHG emissions. The experience at Isalnita Power Station paved the way for a wide spread of the MAP® technology to be installed at out-of-date lignite-fired power plants especially in Countries, like Romania, where lignite is still produced at an high rate and it is the only fuel mined at a competitive price.